LIMITED EDITION: Aztec 1 oz .999 Pure Silver Round | World of Dragons! In ancient cultures, stories about heroes and monsters were an important part of everyday life. They helped people explain objects in the sky, make sense of weather events, or answer life’s big questions. Born around the fire and evolved through word of mouth, tales of these creatures and their supernatural powers were told and retold millions of times from person to person, from trade port to trade port, and from generation to generation - manifesting into a hundred different versions around the world. The story of the dragon is no different. Dragons have been one of the world’s most popular mythological creatures through the ages, and they continue to stir our imaginations to this day. Almost every culture on earth has its own ancient dragon myth. 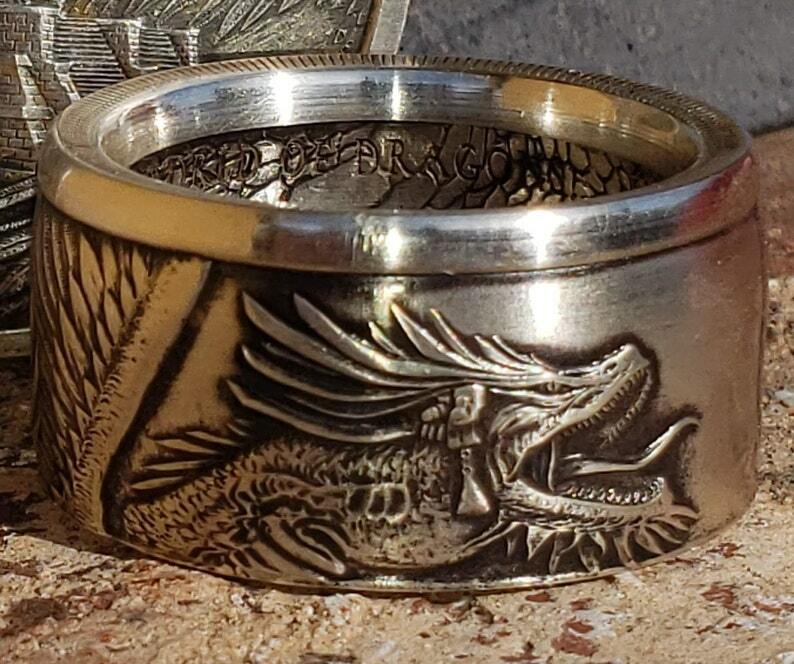 And we are proud to bring them to life in our new, EXCLUSIVE World of Dragons series in 1 oz silver and copper rounds! The first release in this exciting 6-design series celebrates one of the earliest recorded dragon myths in history. The limited-edition Aztec Dragon design celebrates Quetzalcóatl, one of the most revered gods in ancient Mesoamerica. A powerful combination of bird and rattlesnake, this feathered serpent was believed to have organized the original cosmos, participated in the creation of mankind, and was related to gods of the wind, the rain, and the dawn. Aztec high priests would even include the name Quetzalcoatl in their titles to denote their high rank. This limited-edition 1 oz Silver Aztec Dragon round will be minted in limited numbers but won't last for long. So hurry and add the first release in the series to your cart today, while they’re still available! Authentic silver coin converted into a ring in the finish and shape of your choice by Michael Baker, Artisan. The best part is that a portion of all proceeds are donated to charity to help our disabled vets! Were you aware the majority of proceeds are donated to the Wounded Warrior Project charity to help our disabled vets get the treatment needed beyond what is provided by the government or military VA. The WWP assists in extended medical, rehab, re-vocational and assisted living. As a fellow vet who never needed these things, I thank you for taking care of those real heroes who do!